You’ve been hearing about it more and more, millions of tonnes of clothing are wasted every year. Whether it’s wearing them out or they’re simply not fashionable any more, far too many of our clothes are being sent to landfill. The sad thing is that these clothes are valuable resources and could easily be reused or recycled, and saved from the bin. Luckily, there are a growing number of designers and makers who are doing just that! We chat to one such Devon-based designer, Eve Copper, who shares her secrets of how to unravel a knitted jumper and re-knit it into something new and amazing. How To #Re-Knit Your Old #Knitwear! I run a small company, Eve Copper, producing limited edition designs and commissioned pieces. I am also an undergraduate in Fashion Design. My most recent course module invited me to create an outfit under the theme of “sustainability”. As a small design company, I know the value of the UK Fashion industry, and I am always looking for strategy which supports sustainable practice through my design process – so this was right up my street! I really wanted to explore the potential of working with wool, as it’s such a beautiful, sustainable natural resource; and the sheer abundance of discarded jumpers haunting charity shops and jumble sales, make for an incredibly cheap and eco-friendly resource. I decided to take an old garment and reconstruct it into something new and fashionable. The materials for this piece were purchased from a charity shop in Devon; ‘end of project’ velvet finish wool used for the crochet panels of the top (cost £2), and wool reclaimed from a wool jumper (£4). That’s £6 for a new garment – not bad. I bought an XL man’s wool jumper, to provide me with sufficient material for the project. I made sure that it had not felted, through hot washing, and checked that it was 100% wool, and that the seams had been stitched together, and not over-locked to one another. 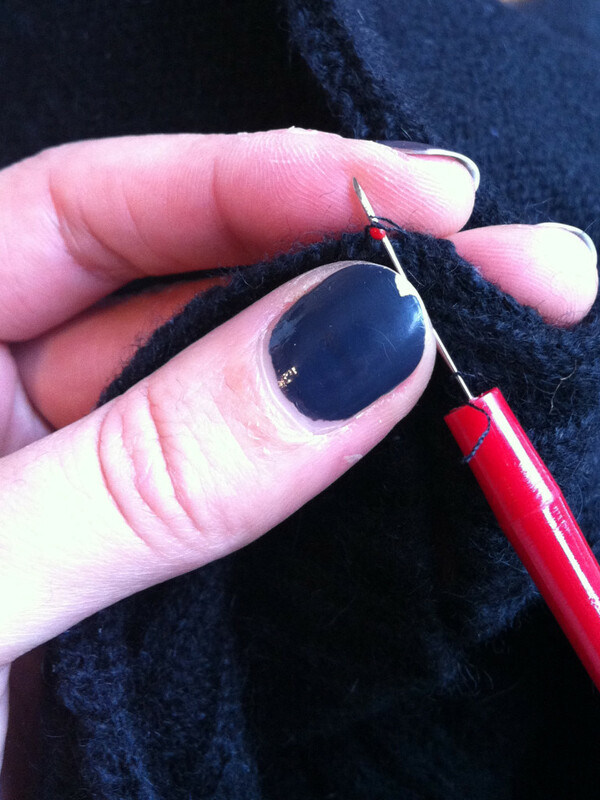 Using a seam ripper, I carefully cut through the seams of the jumper, turning one jumper into a selection of knitted panels. Starting from the top of each panel, I carefully found the last stitch in the knit, cut into it, and unravelled the knit in the wool. As each panel unwound onto the card, I took the wool off the card, and wound it into a bow shape. A gentle hand wash and dry in the cupboard, and it was ready for construction. The wool was in good condition and was already the same colour as my velvet wool. If the colour isn’t quite right, a quick dye at this point will freshen up the wool, and help you match the colour with another yarn you may want to work with. My aim was to create an asymmetric off-shoulder sleeveless top. I created my own pattern for the bodice using a tension square of stocking stitch knit, which I measured and fit against a mannequin. I then hand crocheted chain stitches into circles at random. I used a pre-designed paper pattern as a guide to decide where the circles would sit, and I attached them using a wool needle and tacks. Knitting is new to me, so I’m hoping I’ve got the lingo correct! Despite my limited skills in this area, I’m really pleased with the final texture on the garment, and the piece is very wearable and unique. Although a new technique to me, this is certainly no new process; my Dad used his childhood carding skills to help me, calling on his ample experience learnt while assisting his Mother 60 years ago! In a world where there’s too much waste and resources are under used, I think it’s important for all of us to consider our materials when we create something new. If makers and designers look to combine new technologies, methods from the past and environmentally sympathetic practice in their construction, we can achieve exciting results and take better care of our beautiful world. For more information about my work, please visit me at www.evecopper.co.uk. If you would like some tips for knitting check out our step by instructions on how to Teach Yourself to Knit! Make sure you sign up to my monthly newsletter to receive more informative blog posts, and please share this article! 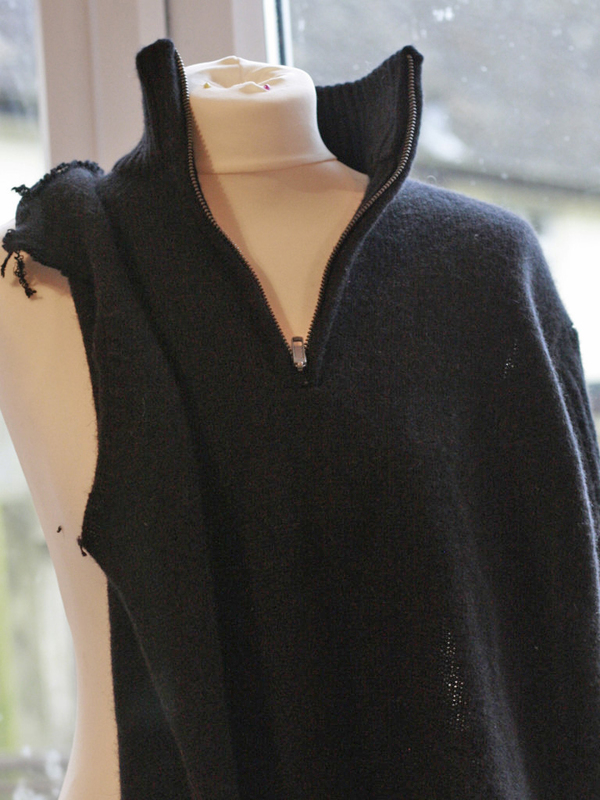 #Deconstructing a #jumper to #re-knit! Carding is actually part of the process of preparing raw wool to be spun into yarn 🙂 it essentially means combing the wool. It arranges the fibers and removes any plant material stuck in the wool. 1) as you pull the wool rows apart wind into a ball. When done make hanks of wool using elbow and hand, secure the two ends in contrasting colour of wool. It will help you find the tie when you need to undo it. Hand wash then dry – this will remove all the wrinkles in the wool. Rewind into balls. Result new wool. 2) deconstructing often means that you end up with relatively small lengths of wool. Keep these and wash as above. They might help you finish the garment, can be used to sew the garment or used to knit a multi-coloured garment. to remove the wrinkles caused by the prior knitting you can also run the wool down through the lid of a percolator or tea pot and out through the spout as the h20 gently simmers. I like to take the arms and sew them into a tube sock and then cut one row of stiches at the heel (slipping the loops onto a stich holder), then take Double pointed needles and knit a heel in. I usually have enough yarn from other parts of the sweater but you can also use a contrasting yarn which looks great if you knit the toes in the same contrasting yarn. a $3.50 silk, wool and alpaca sweater from the thrift store can make three hats a pair of mittens and two of these lovely stockings. You can unravel all of the sweater or use the already knitted material . AND felting ….don’t get me started! !